Welcome to BLUEWOOD LETTING in Coventry, one of the area’s most recognisable brands, attracting hundreds of tenants every month with our wide selection of properties to rent. For LANDLORDS, BLUEWOOD provides an innovative range of services designed to find tenants fast, obtain the best possible rent and manage the whole process of property letting efficiently and effectively. We have an established lettings network with a dedicated property management team. Our advanced technology systems allow us to market your property to suitable tenants across our entire network of portals. For TENANTS, BLUEWOOD has a wide selection of houses and flats to rent and long opening hours, allowing you to view properties at a time that suits you. 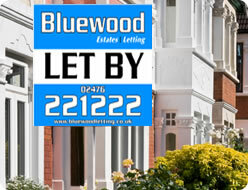 BLUEWOOD was established in 2005, by a group of landlords that felt there was a significant gap in the market for a reliable, personable and committed letting agency service. The company has grown from strength to strength based on trusted principles with modern marketing techniques. With our dedicated property managers, as a landlord letting your property you will be in safe hands and as a tenant, you will find the right home at the right price with hassle free moving.